Perfect credit and a large down payment needed to buy a house in Charleston? Not so much! Call the experts at ChuckTown Homes Real Estate- we can walk you thru it with no drama! 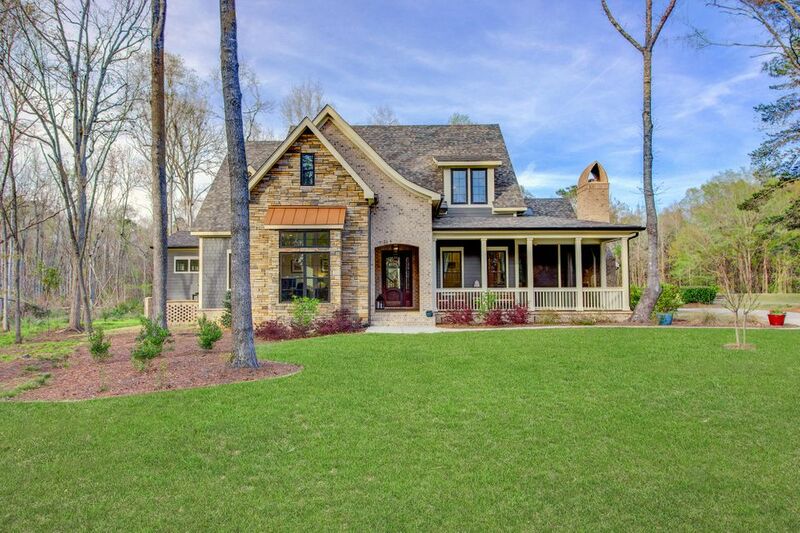 Gorgeous custom estate on the golf course in Coosaw Creek Country Club! No expense spared on this one year old executive home. Be sure to watch the YouTube video! Random width walnut floors greet you behind the custom mahogany and iron front door. Beyond the foyer lies a generous home office and powder room with custom live edge slab vanity. Around the corner is the wine room- with custom wine cellar, built in beer coolers, and a bar with sliding windows that open to a screened porch. With 1,200 square feet of heated porches- this home allows it's owner to take advantage of indoor/outdoor living with total privacy. Only a short walk to the Club and pool, this cul de sac home has no neighbors! Total privacy! Nestled on Coosaw's 11th hole overlooking protected wetlands and a quaint wooden bridge leading to a pond, this is one of the best lots in the neighborhood. Off the kitchen is a screened dining porch with built in infrared heaters in the ceiling and a hand made fireplace adorned with a 200 year old mantle. Sliding glass windows open up bar style to the wine room- perfect for entertaining! 10 foot tall sliding windows in the great room disappear to make full use of the enormous rear screened porch. Screened porch has multiple fans and built in grilling area for those warm summer days and ceiling mounted infrared heaters in front of a TV area for those chilly fall evenings. Porch is wired for sound, has a high end "wireless access point" WIFI system, and mounting hardware for a Charleston daybed in place. Home includes security system wired for cameras. Off the master bedroom is a home gym with rubber floor. The master closets are all custom wood with room for all of her shoes! The master bath is a masterpiece of Carrara marble with a 104" Kohler SOK infinity edge tub for two that fills from the ceiling! The shower is all marble with 3 shower heads and a steam generator. Above the kitchen is a vaulted ceiling clad in shiplap with soaring beams and 2 skylights. The kitchen island is one giant slab of quartzite cantilevered over a sitting area. From the Thermador pro range, Monogram Advantium oven, and Thermador dishwasher to the Calcutta gold marble back splash this kitchen is a chef's dream. Three car plus garage is generously sized to fit the largest vehicles with 8 foot tall doors, workbench, LED lighting, and wired for sound. Above the garage is an 800 sq feet plus in law suite with full bath. Atop the main staircase is a kids loft and generous storage room with shelves. Two of the bedrooms are very large and share a bathroom designed for 4 kids to share- with a water closet, separate walk in shower, and 4 sinks! The third upstairs bedroom is an en suite. Raised slab foundation, premium lumber 2x6 framing, pre wired for generator with ATS, spray foam insulation, Carrier Infinity system, custom cabinetry- top of the line construction quality. Kiawah quality construction in North Charleston! Award winning Dorchester District II schools. Welcome to Coosaw Creek, a Member-Owned, semi-private golf course and country club with over 600 stately homes, located within a 30 minute drive from downtown Charleston. Coosaw Creek is a gated community that winds through beautiful low country wooded wetlands, where inspired custom brick homes sit quietly overlooking the fairways or in the lush natural surroundings. Golf Course Details The 18-hole, Par 71 Arthur Hills designed golf course meanders through pristine wetlands surrounded by the natural beauty of majestic oaks and towering pines. A complete golf practice facility equipped with a natural grass driving range, a chipping and a putting green is located near the club house. Golf leagues for men and women play weekly, and member tournaments are hosted throughout the year. Family life in Coosaw is very active with several planned events throughout the year. During the summer, families enjoy the Junior Olympic swimming pool. Basketball and tennis courts are located near the pool area and are lighted for nighttime family fun. Coosaw children attend school in Dorchester County District Two, which is one of only a few districts in South Carolina to receive accreditation as a quality school system by the Southern Association of Colleges and Schools.